The inspiration to do that comes from a report I got to read on New in Chess about the Aeroflot Open, a russian chess tournament held once a year in Moscow. That tournament is different from most other top-chess events in that all players pay an admission fee and travel expenses to participate regardless of their rating, even if they are strong grandmasters. Winners get their share of the largish prize fund, and competition is fierce: this is rather like gambling for a strong player who is used to be invited to chess tournaments, because he is investing money he could not see coming back. Understandably, the tension is strong for anybody who plays chess for a living. This year the Aeroflot Open counted 69 grandmasters, two rated above 2700 Elo points. One of them, Shakhriyar Mamedyarov, was of course counting on bringing home a sizable chunk of the prize fund, but his plans got shattered by his sixth round game against Igor Kurnosov, a less known grandmaster who won a controversial game with the black pieces. The story is the following: after a few quick opening moves Kurnosov, who is a heavy smoker, began to systematically leave the playing hall when his opponent was thinking at his move. Mamedyarov got suspicious, and asked arbiters to control the situation, and delay the broadcast of the moves of his game over the internet to avoid the possibility that his opponent, communicating by phone or other means with somebody running a strong chess program on a computer, could get hints on which moves to play. His requests were only partly fulfilled, the game went on, Kurnosov developed a very strong and forced attack, and quickly won the game. After his loss Mamedyarov claimed that his opponent had played a long string of "best moves", ranking first among the choices of the chess program Rybka, which is arguably the strongest chess machine available on the market. He filed a complaint, insinuating the suspicion that Kurnosov had received computer assistance in some way, and abandoned the tournament in protest. If you looked at the game in question as I did you would find out that Kurnosov's moves were all rather logical, and not especially characteristic of the "computer-like" style of Rybka. The fact is that the attack was rather forceful in nature, with a long sequence of moves clearly better than all others: any strong grandmaster would have been likely to find the right continuation in such a situation. So it is quite probable that Mamedyarov's allegations were false. What is certain, however, is that casting doubt on his colleague was a really bad and useless move. So much for the Aeroflot incident. As I mentioned at the beginning, reading that story I was reminded of one episode of my past amateur chess career, one which I would rather forget than bring up, since it is the only time in my life that I cheated at the game, something which I consider utterly unacceptable, shameful, and stupid: a real moment of insanity. Here is the story. As the white player came back and played again the strongest move -the 21st, 21.Rg1-, it was my turn to think. I knew that opening pretty well, but we were now deep into one variation which I had only studied a long time before, and my memory was also starting to fail me. The position on the board was extremely sharp, and I felt angry by the fact that I was in the danger of losing to a cheater. The fact that the opening had been my favourite one was added gasoline to the fire that was burning inside me: I thought I had the advantage of knowing more theory than my opponent on the ground we had chosen for our struggle, but now I was finding out that he knew more than me -probably by cheating. Out of a sudden impulse, I jumped up from my chair, rushed out, got to my room, and looked at the variation on my chess opening encyclopedia (volume B). I knew I was doing something wrong, but I just could not stop myself: I felt I was rather struggling against an injustice, defending myself from a cheater rather than being one. I was repeating myself "so you mean war, and you will have it". I went back to the chessboard in a rather altered state. I still remember that my heart was pounding fast as I played the move on the book, 21...., cxd4! 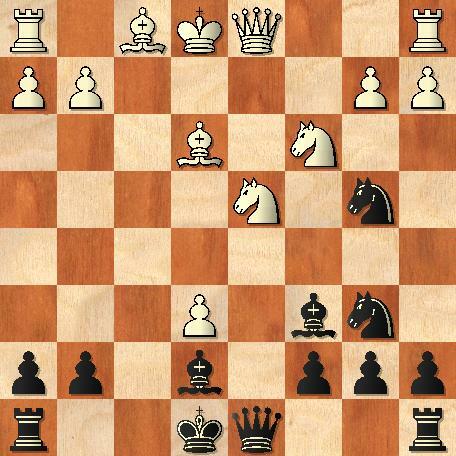 and then, after his confident reply and the ensuing exchange of queens -22.Qxg7+ Qxg7 23.Bxg7-, I reached for my king's rook to play the only possible move in the position, 23....,Rf2. 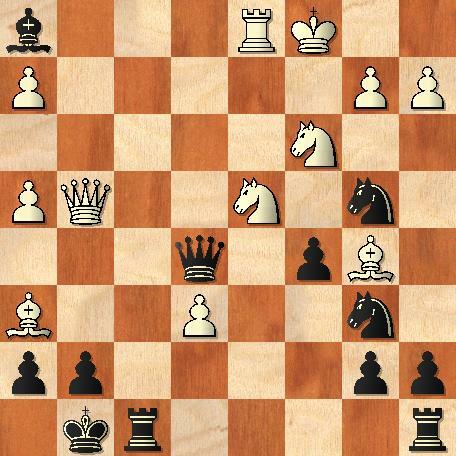 But in the confused state I was, I pushed the rook one square further instead: 23....Rf1?? : en prise of not just one piece -the white rook, which in my mind should have captured my rook and brought me into a won ending- but of the b5 bishop too! My opponent looked at me in dismay, took the rook with the bishop, rose from his chair, and left the table. I was left in a state of consternation, looking at the disaster I had made, and kicking myself for the horrible fingerfehler. 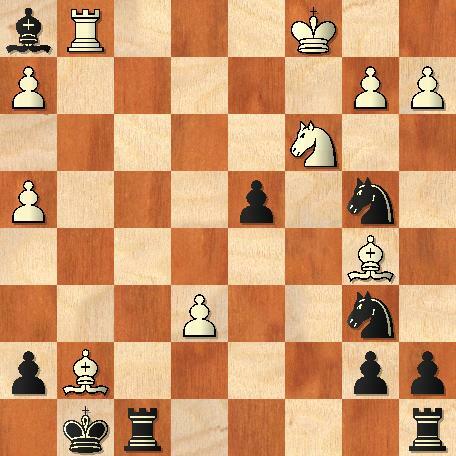 As my opponent returned I played only a couple more senseless moves: 24.Bxf1 dxc3 25. Bxc3+ Kf8 26 Bxb4+. I stopped the clocks, resigned, signed the scoresheet, and left without a word. So, I have come clean now, 22 years after this debacle. What this has taught me is that no matter what situation you find yourself in, you should choose your actions within the boundaries of what is allowed. Maybe you will suffer the consequences, but at least you will walk away from it without shame.